HST For Dummies: Part 1. If you are looking for mainly size, with some strength on the side, HST is the way to go. Continue here for an explanation on HST and how often it should be done. HST (Hypertrophy Specific Training) is quite a revolutionary way of training. The tactics used will keep your body ready to grow again and again. The best thing about HST would have to be that it works for anyone! 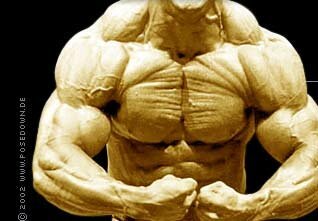 No matter what genetics you have, what size you are, how strong you are, HST will work for you. It takes the basics of muscle physiology and wraps the philosophies in one distinct form of periodization. First off, HST is not just for size, but it&apos;s not a strength program from a muscle mag. that will add 50lbs to your bench in 8 weeks (did add 10lbs to mine in 4 weeks though). You will gain both size and strength, but with the principles of the program, the size will outweigh the strength. A lot of this also depends on you, and how you respond. Second off, you need to have a good diet, HST won&apos;t add inches to you if you follow a crappy diet, everyone knows this. You would obviously add more size if you were bulking, but some people want to take the fat off, and HST is great for cutting also. perform. I myself use only 8, which makes for a nice compact routine. 4 After you figure out your maxes, take 9-14 days off from any training. This is called Strategic Deconditioning (SD). "At this point, it is necessary to either increase the load (Progressive load), or decrease the degree of conditioning to the load (Strategic Deconditioning). The muscle is sensitive not only to the absolute load, but also to the change in load (up or down). "Therefore, you can get a hypertrophic effect from increasing the load from a previous load, even if the absolute load is not maximum, assuming conditioning (resistance to exercise induced micro-damage) is not to extensive. "There is a limit to the number of increments you can add to increase the load. You simply reach your maximum voluntary strength eventually. This is why Strategic Deconditioning is required for continued growth once growth has stopped (all things remaining equal)." Okay, so you&apos;ve figured out all of your maxes and are ready to start working out this Monday. Now here&apos;s a sum-up of how the routine will go. Each rep range (block) (15, 10, and 5) will each be given 2 weeks of training. It doesn&apos;t have to be 2 weeks, but we&apos;ll assume this is your first HST "experience" and you are just going to do the standard. Training will be 3 times a week, once a day (we&apos;ll use M/W/F for this cycle). Again, some people train 6 days a week or some people do an AM and PM split. Each rep range will get 6 workouts over 2 weeks. Now here&apos;s where the weird part comes in (well, against what you probably normally do), you will only train to failure once every 2 weeks (until weeks 7+8, which I&apos;ll get to later). Workout #6 will be your routine with all of your maxes. So what do you do with workouts 1-5? You take your max, and gradually decrease it over the 6 workouts. The amount you increase each workout could be varied, generally 5-20lbs, with bigger bodyparts and compound movements having the bigger increments. I&apos;m not a real strong guy, so for the Squat, Bench Press, and SLDL I increase the weight 10lbs, and for everything else I increase it by 5lbs. This can also be done percent wise (5-10% increments) So, for example, we&apos;ll say your 15 rep max for bench press is 100lbs, and you are using increments of 10lbs. You can calculate YOUR exact weight by using the form and clicking on "Calculate". Note: If you don&apos;t know your 1RM, figure it out here. Ok, so now (hopefully) you know what to do for 6 weeks. Now you&apos;re at your last workout of the 5s (your maxes). Now it&apos;s time for weeks 7 + 8. There are a few ways you can do these weeks. One way is to do negatives with your 2RM for 2 weeks (need a training partner). Another way is to use drop sets. And another way (the way I am using, and probably the simplest and most convenient), is to repeat your 5RMs for two weeks, still training M/W/F. If you can increase the weight, then do so. If you find that you can hit 5 reps on the first set, but can only get 4 or 3 on the second set, that&apos;s fine, just keep going to failure. The amount of sets you use for each workout, like everything else, can be varied. You can fix you sets, so say you do 2 sets of squats and 1 set of curls, you would do that many sets the whole routine. Another way to do this is to progress the sets. The going trend to do this is 1x15, 2x10, and 3x5. So for the 15s, every exercise would be done with one set, for the 10s everything would be done for 2 sets, and so on. This does not include warming up, which should also be a big part of your workouts. See The Warming Up FAQ. Now you have the weekend to rest, and you can start another cycle of HST on Monday, right? Wrong. Time for some more SD for 9-14 days. You can change the rep ranges, exercises, workouts, and scheduling however you want. Use your first cycle to figure out what you can do better for the next cycle. Another note: Some people think that they must do all they can to prevent zigzagging (repeating the same weights in different rep ranges). I zigzagged plenty in my first cycle and had great results, so you don&apos;t have to worry about it.